We write a lot about internet marketing. Strategy and tactics are great, but a large part of what we (and most business people) do involves interacting with other people. Personal relations aren’t as cut-and-dry as numbers. And what’s worse, our brain makes a TON of mistakes in our assumptions about ourselves and others. Since misconceptions between people can lead to disaster in your professional life, I’ve taken some of these errors and applied them to the workplace. These biases can affect your relationships with clients, coworkers, and everyone you come in contact with. We frequently assume that everyone has the same motivations, thoughts, and emotions as us. This is wrong. It’s called the projection bias. If we’re motivated by money, we expect everyone else to be. If we’re empathetic, we expect others to be empathetic. If we think something’s stupid, we expect others to think it’s stupid also. But, as you’ll see from the other biases below, other people are just as complicated and nuanced as you are. It’s a fallacy to assume differently! How to Fix It: You are weird, and so are others. Remember that when you find yourself assuming others will react as you do. Does your coworker drink excessively? Is a vendor a really bad tipper? That could affect how you see their work. This is called the halo effect. It’s our tendency to merge someone’s negative traits into other areas of their personality. Politicians love this: they expose a rival’s dodgy personal life and try to push the assumption that they would be unfit for office. But it’s a mistake to assume that one has anything to do with the other. How to Fix It: Evaluate someone’s skills at work independent of what you know about them outside of the workplace. It’s tough to admit that someone’s better than us. So we usually don’t! Psychologists call this “illusory superiority“. We see our positive qualities as stronger than others’, and downplay the things we aren’t good at. This can lead to trouble. If you think you’re the bomb and you’re not, you can fail where others could have flourished. How to Fix It: Take a true inventory of your skills. Ask yourself, your coworkers, and your boss. Know your real strengths and limitations, and use that to guide your actions. You can predict others reactions, thoughts, and motivations fairly accurately. But you don’t think anyone can do that to you. The illusion of asymmetric insight is when we perceive that our knowledge of others surpasses their knowledge of us. Generalizations are easier to work with than nuanced explanations of others’ behavior. So we use them a lot. But people’s reactions can’t be predicted accurately by your (biased) opinion of them. How to Fix It: Realize that your conceptualization of a person is almost certainly wrong. And that people generalize you to deal with you, too. 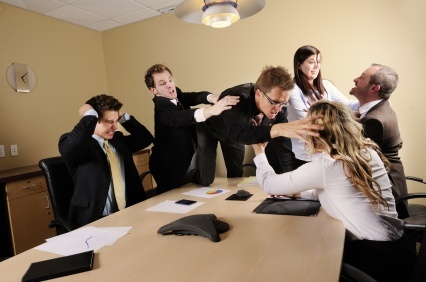 If you lose your cool in a meeting, you’ll blame environmental reasons. But you’re much less likely to do that with others. This is related to the previous cognitive bias. We make generalizations about the people around us, then use them (almost exclusively) to explain their reactions. But with us, it’s the opposite. To us, our personalities have little to do with our reactions. This is known as the actor-observer bias. How to Fix It: Ignore your pre-conceived notions of someone’s personality and look at their behavior given their situation. And evaluate how your personality affects your reactions. You spend a lot of time with yourself, so you have insight into what makes you tick. You know what sets you off, what makes you happy, and what relaxes you. To yourself, you’re a complete and complicated person. But that’s not how you view others! You rely on your generalizations of their personalities to deal with them. But they view themselves as complete and complex people, and you as a slave to your personality. This is the trait-ascription bias. Obviously, this can cause a lot of friction. But neither person has the complete picture of the other person, so don’t assume you do. How to Fix It: Empathize. If you respect that others are complex people, it will improve your relationships with them. Once you’ve got your pre-conceived notions, you weigh evidence supporting your position more heavily than evidence disproving it. When a nice person does something nice, you use that to prove to yourself that they’re a nice person. When they do something wrong, you view it as anomalous and disregard it. This is the confirmation bias. You believe something and select facts based on your assumptions to justify it. How to Fix It: Be objective in your judgments of others. People are complicated (just like you), and your conceptualizations of them don’t go far enough in explaining them. If you’re still interested in how cognitive biases influence your thinking, have a look at this List of Cognitive Biases.